Certification is a huge professional decision to make and should not be taken lightly. This decision consumes a lot of time, effort and money. This is why I am doing this series detailing how I have passed my certification exams. 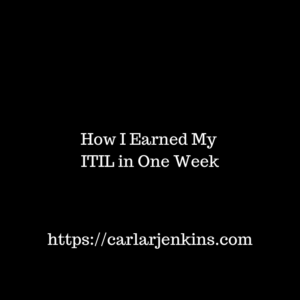 In this second installment, I am telling you what I have used and how I have earned my ITIL (IT Infrastructure Library) V3 certification in one week. My first installment of my passing my Certified Scrum Master (CSM) license in 5 days here. I am giving people a peak behind the rainbow to help them make better decisions in whether or not to pursue professional certifications.